The Graveyard Shift – Where Was I For This? New to Talk Amongst Yourselves? Jump in and say hello! This is the Graveyard Shift—the nightly hang-out hosted by Kotaku’s reader-run blog. Feel free to hop on in and join the discussion! When you’re done here, check out the articles at TAY or TAYClassic! Or if this is your first time at TAY, check out this TAYtorial! This morning while I was getting breakfast and preparing to head to class, I hopped on YouTube to see if I’d missed anything. While I somehow missed the fact that North Korea was being North Korea again, I did manage to stumble onto something even more unexpected. I noticed a video of Classic Game Room doing a review for Donkey Kong 3. At first, I totally thought it was a joke. It took me a few moments to even vaguely recall what Donkey Kong 2 was—or if it was even a thing. 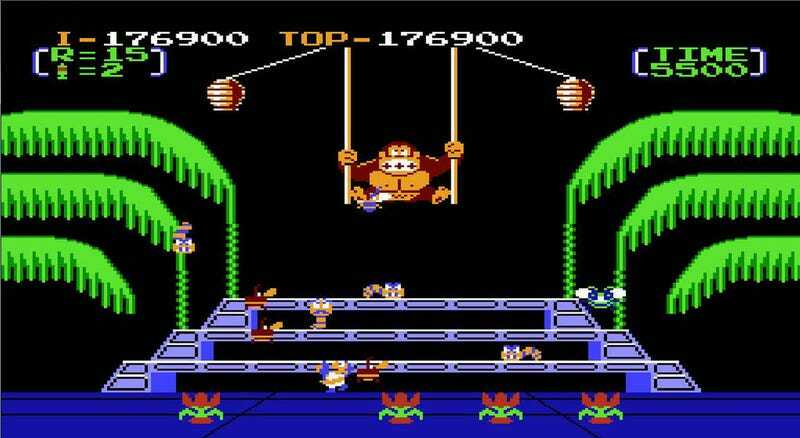 Every time I tried to recall it, I could only bring up images of Donkey Kong Jr. But apparently that wasn’t what it was. Regardless, I started to watch the video, and the further and further along I got with it, I started to believe that it really wasn’t a joke after all. But even then, I still had enough doubt in my mind that I had to go double check on Google that it wasn’t all just some sort of elaborate prank. My doubt was unfounded. The game, to my complete surprise, was entirely real. In my defense, the game doesn’t look anything like previous Donkey Kong games. It doesn’t even star Mario or Jumpman—the protagonist of this game is a man named Stanley. He’s not an office worker, like some of you are accustomed to him being. Instead, he’s an exterminator who works with both insects and apes alike. He sprays poison directly above his head, like the real exterminators do. This is partly because he has to protect the flowers he’s almost trampling over, but also so he can douse Donkey Kong’s feet and… umentionables with some sort of pest/gorilla repellant. It’s a bit of a top down hooter, but you also have to dodge enemies around your feet by moving up and down levels. And the shattered husks of exploding insects. Those are bad. I was actually kind of excited by what I saw. Even though it doesn’t really look like a Donkey Kong game in the slightest, it still seems like a lot of fun. Apparently, it was good enough that Nintendo brought it to at least one of its Virtual Consoles. Which makes me have to ask: why did I not know about any of this sooner? This brings us to today’s questions, TAY. What are some games that you wish you knew about earlier? What are some of your favorite, lesser known Retro games? But maybe you don’t feel like talking about the past. Or things that you’ve overlooked entirely. If that’s the case, feel free to talk about life, love, gaming, or whatever else you desire. The Graveyard Shift is now open! The Graveyard Shift – I’m Awake!